Chandler hit the ground running Monday on the first day of spring football practice. And I mean, hit the ground. Defensive coordinator Thurman Moore put the defensive players through a grueling conditioning workout, maneuvering through an obstacle course of sorts, that included bear crawls, right off the bat. From there, the offense came out, putting the numbers over 160. And the Wolves were off. This could be the greatest Chandler football team ever assembled with key transfers J.W. Windsor, a defensive lineman from Chandler Basha; and center Vinny Vitale and wide receiver N’Keal Harry from Tempe Marcos de Niza. Offensive lineman Riley Pollard, a legit 6-foot-3, and 330 pounds, moved in from Australia, where he was brought up in rugby but carries a burning football passion. The offense is led by quarterback Bryce Perkins and running back Chase Lucas, who keyed last year’s first victory in school history over Chandler Hamilton, before Hamilton edged Chandler in the Division I semifinals. The talent is off the charts, but Moore implored that it takes “heart” to make this a special team. It won’t be able to win on speed and athleticism alone. Coach Shaun Aguano has made it clear to everyone, even Perkins, that nobody’s job is safe. The competition will be fierce. Perkins will be pushed at quarterback by Mason Moran, who will play safety on defense. Aguano said there are at least five running backs who could make an impact. 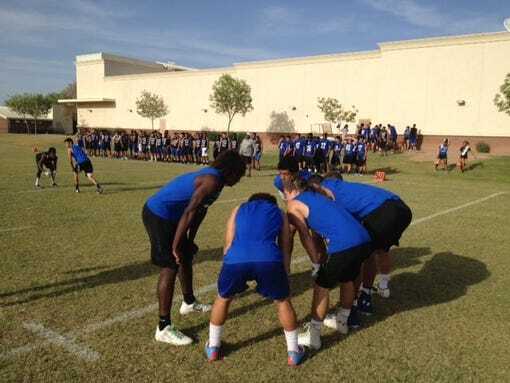 Chandler High has the makings of a state championship team. It starts now with spring practice. 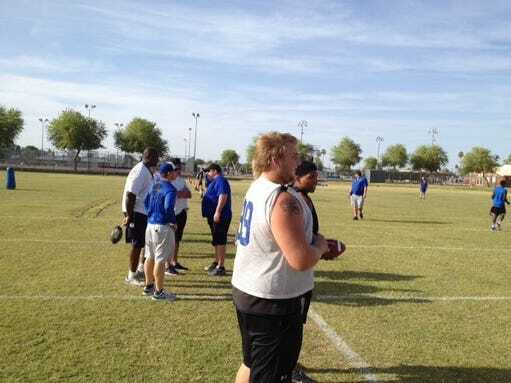 Richard Obert/azcentral sportsThe offensive line could averaged close to 300 pounds. And even though most of the defense has to be replaced, this defense could be faster, more physical and more athletic than the one that was the key to last year’s break-through win against Hamilton. The key is having Moore as defensive coordinator. He has close to 30 years experience at the college and NFL level. When he came in last year, Chandler’s defense suddenly got better. Moore is as good as there is in the high school ranks at getting the most out of his defenders. “Our emphasis is on finishing plays,” Aguano said. “We want to get their legs right. The first couple of days (of spring ball) is going to be tough on them. Chandler quarterback Bryce Perkins doesn’t seem phased that Arizona State got a second quarterback commitment out of the 2015 football class. Perkins, 6-foot-3, 215 pounds, committed first to ASU, followed last week by Brady White, 6-2, 186, a four-star recruit who is ranked as the third-best pro-style quarterback in his class in the nation by Rivals. Perkins is a dual threat who has improved his passing mechanics. He committed to ASU with the idea that he will compete at quarterback. Last year, Perkins passed for 2,244 yards and 24 touchdowns with six interceptions, completing 70 percent of his passes. He ran 808 yards and 18 TDs on 125 carries, leading Chandler to the Division I semifinals. 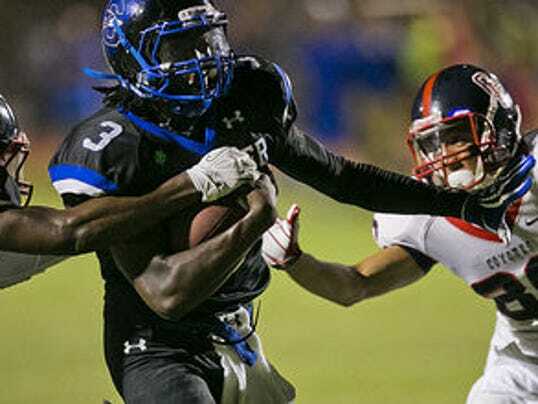 Arizona State is hoping Bryce Perkins is the first of many. The 2015 Chandler High quarterback committed Wednesday to ASU after receiving offers from Arizona, UCLA and Northwestern. Deputy head coach Mike Norvell and the Sun Devil coaches are hoping Perkins’ commit will open a pipeline to the east Valley school which has produced star quarterback Brett Hundley and Bryce’s older brother Paul, both at UCLA. Former Wolves’ standout Dion Jordan starred at Oregon and now plays for the Miami Dolphins. The 6’3, 210-pound three-star recruit, who was recruited by some schools as an athlete, is rangy and dangerous with both his arm and feet. He threw for 24 touchdowns last fall as a junior and added 18 more on the ground. Bryce’s father, Bruce Perkins played for the Sun Devils and in the NFL in the late-80′s, early 90′s. ASU signed two quarterbacks from the 2014 class in Manny Wilkins and Coltin Gerhart, both from California. All Pac-12 performer Taylor Kelly returns as the starter for his senior season and redshirt junior Mike Bercovici likely backing him up in the fall. 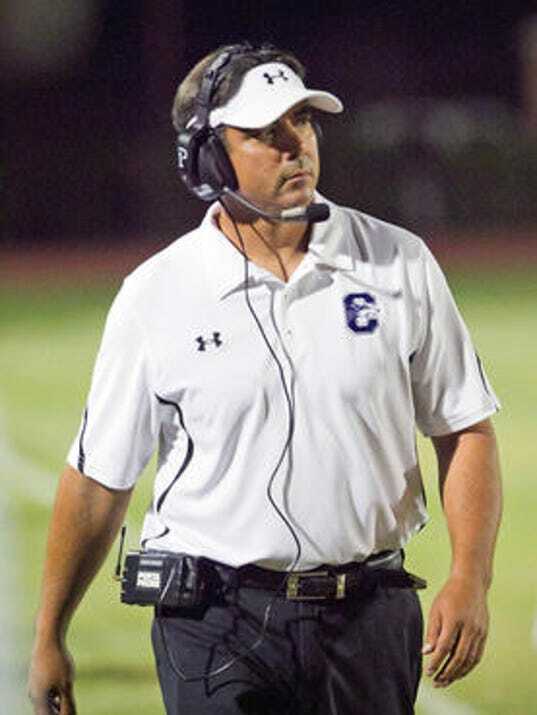 Below are hi-lights from Perkins’ 2013 season at Chandler. It had been five years since Chandler last played in the state tournament and Marco Morales was determined not to let this year’s appearance end up in the one-and-done category. Morales drained nine of the Wolves’ 14 3-pointers and scored 29 points as 18-seed Chandler defeated 15-seed Desert Vista 76-64 in a first-round game at Desert Vista. On this edition of the Recruiting Roundup, Signing Day 2014 has come and passed. But that doesn’t mean the world of football recruiting takes a break. Jared Cohen and Jason Jewell bring you the latest offers to underclassman in Arizona plus some players the guys have their eye on for the next year. Players mentioned: Brian Lewerke – Pinnacle, Chase Lucas – Chandler, Paul Lucas – Mountain Pointe, Kayden Lyles – Saguaro, Caleb Peart – Hamilton, Cassius Peat – Corona del Sol, Bryce Perkins – Chandler, Garrett Rand – Hamilton, Dedrick Young – Centennial. Members of the NCSA Football Staff, led by former college recruiting coordinator Randy Taylor, spent several days in San Antonio, Texas, this month for the U.S. Army National Combine and the U.S. Army All-American Bowl. They had the chance to watch and evaluate over 600 top underclassmen from around the country compete at the Combine. The list below is who they thought to be the best during the competition.